BBC Sport Academy profile Richard Gasquet, the newest - and youngest - star to hit men's tennis. You're 15, still at school and playing in your first profesisional tennis tournament against a player ranked in the top 50 in the world, 11 years older than you. That's what happened to French wonderkid Richard Gasquet. He was making his professional debut, in the the famous Monte Carlo Masters, in April when he beat 26-year-old Argentine Franco Squillari. 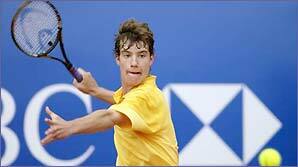 He then played world number four Marat Safin in the next round. Although the Russian knocked Richard out in straight sets, his astonishing arrival made headlines around the world. Richard had been shining on the junior circuit in France for some time, winning tournaments home and abroad.